Featuring a terrace, FabHotel Grand Savoury Fandhook Indiranagar is located in Bangalore, 1.7 miles from Commercial Street. Located around 2.4 miles from Chinnaswamy Stadium, the hotel is also 2.9 miles away from Bangalore Palace. The property is 2.9 miles from Cubbon Park. Guest rooms in the hotel are equipped with a flat-screen TV. Featuring a private bathroom, rooms at FabHotel Grand Savoury Fandhook Ind also have free WiFi. Indira Gandhi Musical Fountain Park is 3.1 miles from FabHotel Grand Savoury Fandhook Indiranagar, while Brigade Road is 3.2 miles away. The nearest airport is Kempegowda International Airport, 21 miles from the property. When would you like to stay at FabHotel Grand Savoury Fandhook Indiranagar? House Rules FabHotel Grand Savoury Fandhook Indiranagar takes special requests – add in the next step! 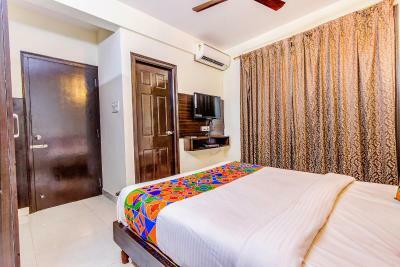 Any additional older children or adults are charged INR 5000 per night for extra beds. We need at least 5 reviews before we can calculate a review score. If you book and review your stay, you can help FabHotel Grand Savoury Fandhook Indiranagar meet this goal. I love it and i enjoy. Good service and staff as well.